Sound that plays automatically is certainly one of the more annoying experiences that users may have on today's Internet especially when it is unexpected. Starting in Firefox 66, the browser will block websites from playing sound automatically. Mozilla follows Google's implementation which introduced a function in Chrome 64 that blocked autoplaying sound in the browser. 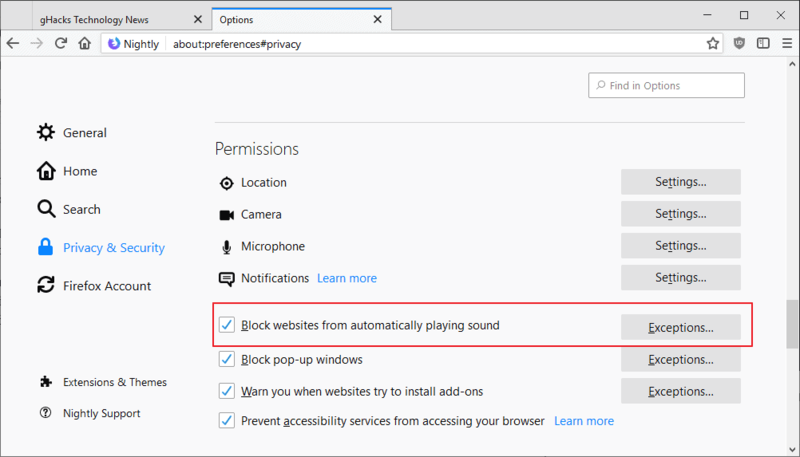 Firefox will block media on Internet sites if audio playback is enabled and automatic on that site. It won't block autoplaying media if sound is muted by the site. The preference "Block websites from automatically playing sound" defines whether autoplaying media with sound is blocked or not in the browser. Firefox users may control autoplaying sound in the site information dialog as well. Just click on the "i-icon" next to the site address to display options to control site behavior. There you find the new "autoplay sound" permission listing if the site in the active tab tried to play sound automatically. Select "allow" to allow playback, or "block", if the default setting in Firefox allows autoplaying sound. Firefox's autoplay blocking functionality supports several permissions that control it. Firefox users may configure the browser to block autoplay by default, allow autoplay on user interaction, or block web audio. Mozilla follows Google’s implementation which introduced a function in Chrome 64 that blocked autoplaying sound in the browser. It’s good to see Mozilla being cutting-edge again, incorporating something which has been present in Chrome for the last, oh, eight versions? That’s some high tech cutting edge you got there. Do you know what else is present in your Chrome? Google telemetry and data collection with a tracking bonus for users like you. Eight versions of fail. Fair enough. I am sure that Mozilla is a paragon of virtue, righteousness, fairness and transparency, whose sole objective in this evil world is to protect their users’ soul from Google’s clutches. Dream on. I dislike autoplaying video and audio. I generally won’t go back to a site if it has either. @Chris: That’s my preferred solution as well. Now that the Google Big Browser has blocked it those bad sites will be forced to adapt, because otherwise average users won’t know that adding an autoplay exception is what will fix the sites. This reminds us of the power Chrome has on sites due to its market share and that we should therefore not use it because Google can’t be trusted in general. Currently I am using the MuteLinks extension to have this behaviour. It works great, but having this feature built-in is awesome. Martin, Thanks for the great news heads up. Personly I believe that this is a feature which should already be installed in Firefox 1 beta, but that’s just silly me. This new mute possibility would be even perfect when there is also included the standard volume setting level control feature when your starting, to play anything. Do you Martin ( Or anybody else who knows this) or this on wanted volume startup feature for every website or even for all website the same volume will be integrated or will be integrated into Firefox in the hopefully near future?